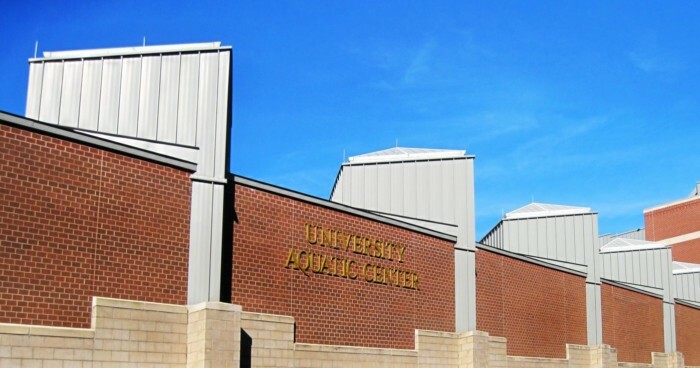 Constructed in 1990, the Aquatic Center is prominently located in the heart of the University of Minnesota’s main campus. It is part of the complex that includes historic Cooke Hall and the Sports Recreation Center. The Aquatic Center houses an Olympic-sized pool and diving platforms, and hosts NCAA swim meets and other national events on an annual basis. We were retained to perform a forensic evaluation of the Aquatic Center’s east wall. Condensation and freeze/thaw in the masonry wall had deteriorated the brick and masonry to the point where brick units were starting to fall off. We conducted a forensic evaluation that included an infrared thermographic inspection. Using the WUFI program, we conducted an analysis of moisture migration through the wall. We quickly determined that interior pool air was leaking out into the wall cavity where it was condensing and freezing. Infrared inspections revealed the location of air leaks through expansion joints in the wall and around hollow metal door frames at exit doors. We identified the scope of necessary repairs, developed repair details and completed the construction bid documents. We also provided assistance to the owner during the contractor selection and award process.